60% of what you put onto your skin is absorbed into your bloodstream in 26 seconds or less. The E.U. has banned 1300+ questionable or harmful chemicals in the product formulas of personal care products and restricted the levels of over 250 more in such products. In Canada, Health Canada maintains a current list of close to 500 chemicals that are prohibited for use in cosmetic products and a current list of close to 80 chemicals that are restricted for use in cosmetic products. The United States has only partially banned 30 to date. This year, I've had more and more clients coming to me with hormone imbalances, particularly estrogen dominance issues (ovarian cysts, mood swings, breast swelling/tenderness, irregular periods, etc). One of the major factors influencing estrogen dominance is actually the personal care products you use as many of them are xenoestrogens, which mimic estrogen in your body, therefore throwing your hormones out of balance. Many of the 1300+ potentially harmful ingredients that have been banned in the EU have been linked to cancer, reproductive issues and hormone disruption. Given the lack of regulation in the industry, if you are in Canada or the US, this means it’s time to take matters into your own hands. That’s why I’m soooooo excited to have partnered with Beauty Counter to bring you cleaner beauty products, made without 1300+ questionable or harmful chemicals, that actually work. 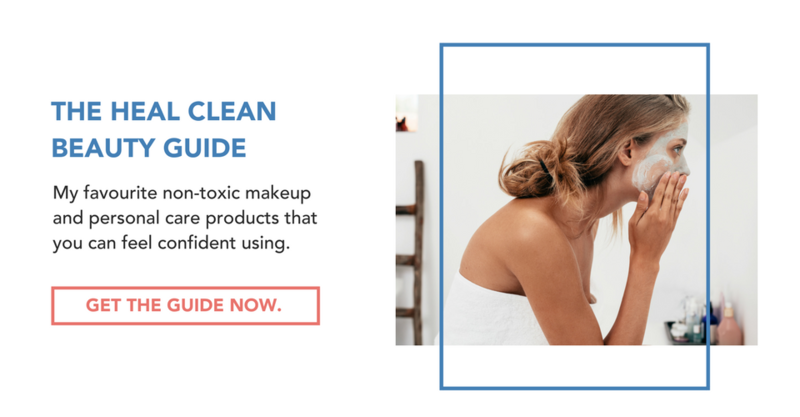 Now, without further adieu, here are 10 toxic ingredients in your makeup bag to steer clear of, none of which are in any Beauty Counter products. Benzalkonium chloride: a disinfectant used as a preservative and surfactant associated with severe skin, eye, and respiratory irritation and allergies. Found in: sunscreens, moisturizers. BHA and BHT: synthetic antioxidants used to extend shelf life. They are likely carcinogens and hormone disruptors and may cause liver damage. Found in: lipsticks, moisturizers, diaper creams, and other cosmetics. Formaldehyde: used as a preservative in cosmetics. A known carcinogen that is also linked to asthma, neurotoxicity, and developmental toxicity. Present where quaternium-15, DMDM hydantoin, imidazolidinyl urea, diazolidinyl urea, sodium hydroxymethylglycinate, 2-bromo-2-nitropropane-1,3 diol (Bronopol), and several other preservatives are listed. Found in: shampoo, body wash, bubble bath. Methylisothiazolinone and methylchloroisothiazolinone: chemical preservatives that are among the most common irritants, sensitizers, and causes of contact skin allergies. Found in: shampoo, conditioner, body wash. Sodium Lauryl Sulfate and Sodium Laureth Sulfate (SLS and SLES): SLS and SLES are surfactants that can cause skin irritation or trigger allergies. SLES is often contaminated with 1,4-dioxane, a byproduct of a petrochemical process called ethoxylation, which is used to process other chemicals in order to make them less harsh. Found in: shampoo, body wash, bubble bath. If you’re looking to start cleaning up your makeup bag, or personal care products in general, take a peak at Beauty Counter. My personal favourite products so far are the charcoal face mask, the nourishing cream cleanser, the mascara and the nourishing day cream. PS - if you are really interested in this subject, check out this video on Good Morning America called Behind the Beauty Counter: What's Really in Your Makeup?